Updated May 23, .. 2010. After a year - long break from training and managing some aspects our business.. I am again training all client dogs / started dogs here at Sauk River. I will resume full e-mail and phone duties starting May 24th, 2010. Website updates will occur each Sunday morning. Beginning June 10th, I will be on a same -day next - day response time to all phone and e-mail inquiries. Until then, ..thanks for your patience. I will be resuming APLA testing for clients in the Fall of 2010. Get your prospect here early! I look forward to serving you in 2010 and beyond. Several opportunities for pups are upcoming in Summer / Fall 2010. See the UPCOMING LITTERS page for information. We are on a performance based system rather than a pay per month system. We charge by what we accomplish. While I have always done this. I am formalizing that system starting in June. The system of training which I have developed for starting a gundog, allows me to do much more in the early time-fframe than most trainers will accomplish. Come see us if you get the chance! Jane, and I are empty - nesting now. We need some company. Seriously, we do welcome the chence to meet you first hand and give you a personal sense of the training, the dogs , and the facility here at Sauk River Retrievers. You can see the Sauk River Dogs dogs, watch some training, and get a feel for a world-class breeding and training program. Cool video of a Year - old Phoenix x Scarlet Dog on point. The video is 7 min long. Sorry about that. Gage actually points at about 4 min 30 seconds. I had to shoot the bird while filming. Didn't really plan on that. Had to take time to switch gun and camera hands. Made the shot which is very rare for me! Of Course Gage, who is a very good marker. Misses this mark but you get the idea. Gage holds point with good control. This dog was with us for 2 months of Advanced Training. Gage hunts quail with his owner in his home state of Alabama. 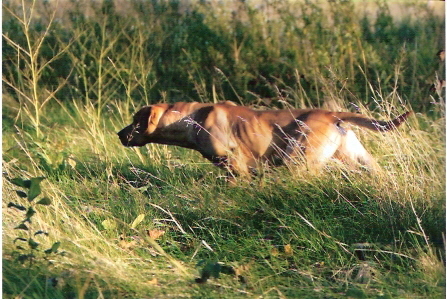 in the breeding and training of Pointing Labradors. Please call or e-mail or David or Jane personally if you have questions about an upcoming litter, started dog, or training for your gundog. Some of you waited nearly a year to obtain a pup in 2010. We appreciate your patience. As many will attest.... It is worth the wait to take advantage of the years of selection and testing we have been through to develop the program we have today. We have been fortunate in that our foundation dogs are clear with the exception of one carrier. I will be reinventing a way to better show all health information on the site. For now, the only carrier we have is Magic. Sauk River Retrievers will not be producing any litters this year with a chance of EIC affected dogs. There is no need for puppy owners to worry about testing their Sauk River puppy. © 2010 Sauk River Retrievers. All rights reserved.